V PUP (V Puppis). Puppis, the Stern of ancient Argo (the Ship), is so filled with bright and fascinating stars and other celestial sights that it's hard to pick one over another. But among all of them, V Puppis stands out as the only naked-eye (so the observations seem to say) black hole, thus topping the black hole prototype, Cygnus X-1. That leading statement requires quite a lot of qualification. By definition, you can't see the black hole itself. At the "surface" of such a beast (called the "event horizon"), the escape velocity (that required to leave and not come back) equals the speed of light, and the body disappears from view. It's there, as is its gravity; you just can't see it. But you CAN see the effect that it has on its environment, in this case a massive double star, which is the actual naked-eye object. Fourth magnitude (4.41) V Puppis is a double star 1165 light years away that consists of two hot blue class B stars (a B1 dwarf coupled to a B3 subgiant) in tight mutual orbit, the orbital period only 1.4545 days. With an orbital tilt of just 11 degrees to the line of sight, each of the two stars partially eclipses the other, resulting in strong variations in brightness of some six tenths of a magnitude, hence the variable star name of "V." (The letter "vee" does not stand for "variable," but for the fifth variable star found in the constellation, where the first is "R." Astronomical nomenclature can be strange indeed.) 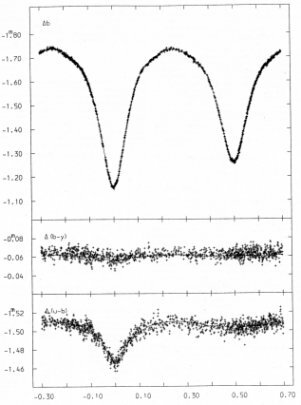 Analysis of the light curve (magnitude plotted against time) coupled with that of the velocities from spectroscopy give masses of 14.9 Suns for the hotter (28,200 Kelvin) B1 star and 7.8 Suns for the cooler (26,600) member. The radii come in at 6.2 and 4.9 solar. Kepler's laws then tell that the two are just 15 solar radii apart, only 2.5 times the radius of the brighter of the two. The stars are nearly in contact with each other. They are so close that the "radii" don't mean much, as the stars will each be tidally (and rotationally) distorted. The larger star raises such huge tides in the smaller that it fills its zero-gravity surface (the "Roche Lobe"), where the gravities of the two stars in a sense cancel each other. The smaller thus loses mass to the larger and to the system as a whole, as also told by spectroscopic signatures of circumbinary matter. The system is thus rather like Algol, except that in Algol's case, the larger is losing to the smaller. Allowance for 0.2 magnitudes of dimming by interstellar dust, distance, temperatures (which tell of huge amounts of ultraviolet light) give respective luminosities masses for V Pup A and B of 16,900 and 7940 solar, smaller radii of 5.5 and 4.2 solar, and masses of 13 and 11 solar. Radii are in decent agreement with those derived from the orbit and eclipses, as is the mass for the primary companion, but the other mass is not, most likely the result of non-sphericity (which also compromises temperature), a poorly known distance, and evolutionary changes caused by the mass transfer. Written by Jim Kaler 1/02/09. Return to STARS.